What started as a wacky idea for a cool birthday party has turned into Movie Parties, where you’ll find everything you need to create your very own star-studded video extravaganza. Movie Parties supply original film scripts for children’s movie-making parties. 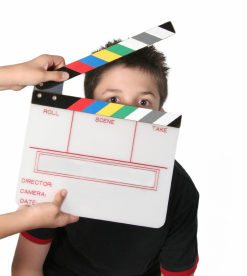 We specialise in stories and mini-movies of particular appeal to children aged 8-14. With our movie party packs to guide you through the day, it only takes a couple of hours to create something really special that will have your party talked about for weeks to come. Our aim is to provide fresh, lively material to help stimulate and harness children’s natural creativity and enthusiasm. We’re keen to promote enjoyment and understanding of all aspects of film-making, and to encourage kids to get involved from an early age. We’re proud to acknowledge that the Movie Parties website is built on open source tools and software, including WordPress. Our fabulous creative agency is Common. Movie Parties was established in 2007 and since then has sold parties all over the world. We are based in West Yorkshire in the United Kingdom.